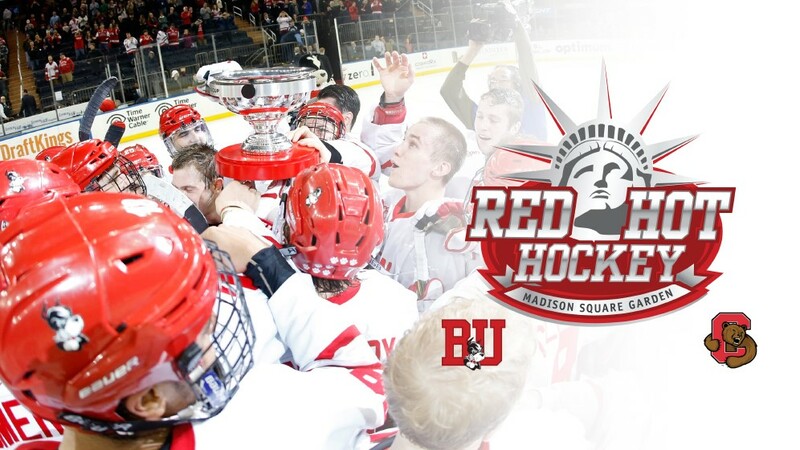 The #19 Terriers and #7 Cornell Big Red have descended on New York’s Madison Square Garden to contend for the Kelley-Harkness Cup in the sixth edition of Red Hot Hockey. Two seasons ago, BU and Cornell played to a 3-3 overtime tie; in the shootout to determine who would take home the Cup, Matt Lane scored for BU while Connor LaCouvee stoned Cornell’s Matt Buckles. BU has won three of the five previous games and tied in the 2009 game as well as the 2015 match-up. BU Athletics has prepared a highlights video beginning with the Terriers 6-3 victory in 2007. Cornell brings an 8-1-0 record into the game following Tuesday’s 5-4 win against Niagara. The Big Red is led by freshman goalie Matthew Galajda who has a stingy 1.92 GAA and a .913 save percentage. On the offensive end, senior Trevor Yates has team-highs in goals (6) and points (10) while sophomore Jeff Malott has eight points (3g, 5A). While the Terrier offense has been paced by veterans Patrick Harper, Bobo Carpenter, Chad Krys and Jordan Greenway, freshmen have increasingly been contributing. 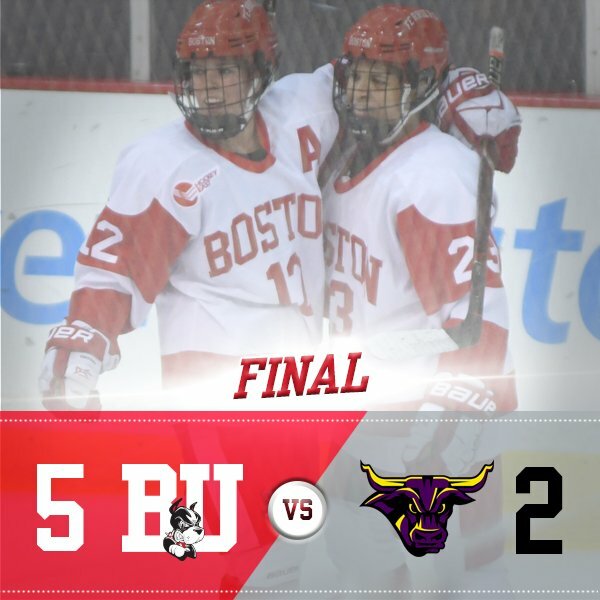 Shane Bowers and Logan Cockerill each scored twice in the series against Maine, while Brady Tkachuk and Hank Crone each scored their first collegiate goal. ► Once again the morning skate for Red Hot Hockey is in Central Park with Ice Hockey in Harlem. 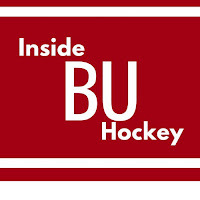 This week’s episode of Inside BU Hockey features Bernie Corbett’s interviews with Head Coach David Quinn and freshman forward Cockerill, whose brother, Garret, is a senior defenseman at Northeastern. Cockerill, who had two assists to go with his pair of goals against Maine, was drafted by the New York Islanders in the seventh round of the 2017 NHL Entry Draft. 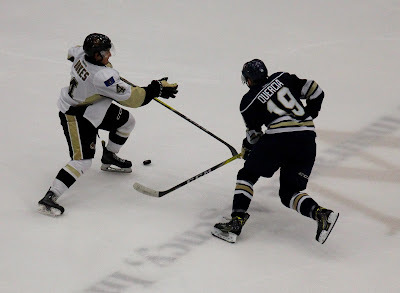 Jeff Cox of the New England Hockey Journal looks at local college players who are candidates for the U.S. Junior National Team that will defend the World Junior Championship gold medal next month, including Krys, Harper and Jake Oettinger. 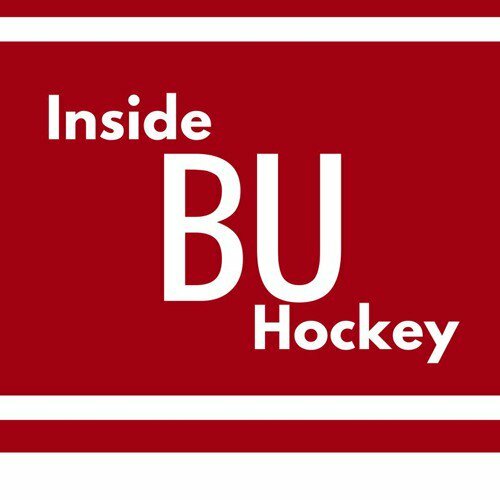 ►This week’s Hockey on Campus podcast features: Cornell Coach Mike Schaefer, College Hockey Inc’s Mike Snee discussing potential expansion of Division 1 and legendary Terrier Coach Jack Parker on the origins of Red Hot Hockey. It airs on NHL Radio (SiriusXMChannel 91) on Saturday morning at 8 a.m. ET and Sunday morning at 10 a.m. ET. You can also find it here on College Hockey News. 2018 or 2019 recruit Matt Quercia scored a goal, added an assist and was +3 for the night in Sioux Falls 6-3 win against the NTDP U17s. 2018 recruit Ryan O'Connell has been named to the Canada West camp roster for the upcoming World Junior A Challenge. O'Connell, a Toronto draft pick, has 14 points in 22 games for BCHL Penticton. Former Terrier All-American and captain Matt Grzelcyk scored his first NHL goal in the Bruins’ 4-3 win against Pittsburgh. Grzelcyk converted a pass at the bottom of the left circle for Boston’s third goal. Charlie McAvoy had set up the Bruins second goal with a steal and a cross-ice pass to Sean Kuraly. ● Yahoo! Sports Grzelcyk's first goal for Bruins "a jolt through the system"
A Tweet about Wednesday’s Bruins-Devils game in New Jersey that Boston won on a McAvoy shootout goal. Bach gave BU its first lead at 6:43 of the first, but it was matched a minute later by the Mavericks. It took just 20 seconds for Bach to restore the Terriers’ lead. In the middle period, senior Nina Rodgers scored two in a 1:47 span to extend the lead to 4-1. Minnesota State’s power play goal cut the margin to two goals, but Bach completed her hat trick in the final seconds of the period, making the score 5-2. Freshman Corinne Schroeder stopped 29 Mavericks shots en route to her fifth win. Bach leads the Terriers in goals with 13 overall and eight in the past three games.